It's the lead up to the 2004 Olympics and retired alcoholic actress, Sonia Varika is living in a house in Athens with several unrelated people, when it is torched by persons unknown. Sonia survives, barely, rushed to ICU and the prognosis doesn't look good. When the fire reaches the news, it deeply affects two of her former lovers: Chronos Halkidis, a colonel in Internal Affairs and a not very respectable lawyer, Simeon Piertzovanis. Chronos immediately demand to lead the investigation into what is obviously arson however it soon becomes apparent that the matter is to be covered-up and a statement claiming the fire was an accident is released. Whoever is concealing the truth is high-up and Chronos is told to drop the case. Publicly he agrees to, but soon he gathers a small team and along with Simeon, somewhat reluctantly, they determine piece by piece who was responsible and why. The case takes them geographically from seedy bars to well-to-do houses and mentally, from a state of coping to the point of breakdown, as the investigative team shrinks to what Chronos describes as a "deranged-police-officer/alcoholic-lawyer combo". Billed as Greek noir, I wasn't expecting to like this as much as I did. The word "noir" tends to put me off with its connotations of dark and hopelessness. Two-thirds of the way through, however, I was frantically googling to see if there were more books featuring these characters; as I read further on it became apparent that this was most likely going to be a standalone. ...tried really hard to persuade myself that that fatty, who in a couple of months would become prime minster, was our saviour and would deliver us from financial ruin and corruption. It didn't work. There are a lot of lines like that which made me smile and there are probably even more, which with my lack of knowledge of Greek culture meant I didn't get. Interspersed in their narratives are flash-backs to their time(s) with Sonia and I found these less interesting. I couldn't really see why they were so besotted with her as she seemed quite annoying. So-long as you take their devotion as a given, this is a gripping, gritty tale of love and loss and revenge and I look forward to the next book from Sergios Gakas. 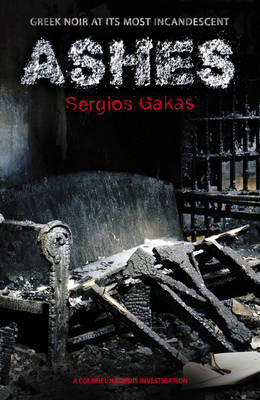 Read another review of ASHES.